Long have I wondered where they were taken – supposedly at Preston Barracks, Brighton. Having driven down the A27 into Brighton for years and years through Moulsecoomb (by the council estate) and then past the old site of the barracks, often have I mused as the barracks are no longer there. Shame, so nothing to compare the pics to. But just the other day, I was in the passenger seat looking out the window on the way out of Brighton, went past said barrack site, then a few hundred yards further on past Moulsecoomb Place (lovely Georgian house, now Brighton University offices). 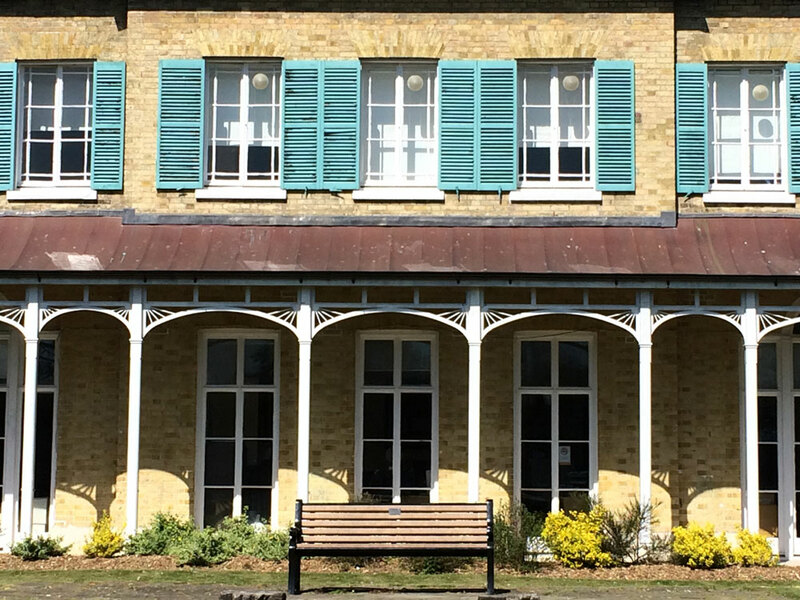 It has a very distinctive iron verandah along the front. Look at the pics of the Dragoons and Lancers. Where are they standing? Blow me down! It’s the SAME verandah! Oh, the rapture! So I got Alison to hang a very quick left, into the car park and I leap out, take pics, and stand on that very spot where our chaps stood in 1855! Well done, Roy! I wonder if any students at the university, sitting on that bench or walking past, feel the presence of those men? Almost certainly not, but how very perplexing for them if they ever did. There’s more on Moulsecoomb Place in Wikipedia. 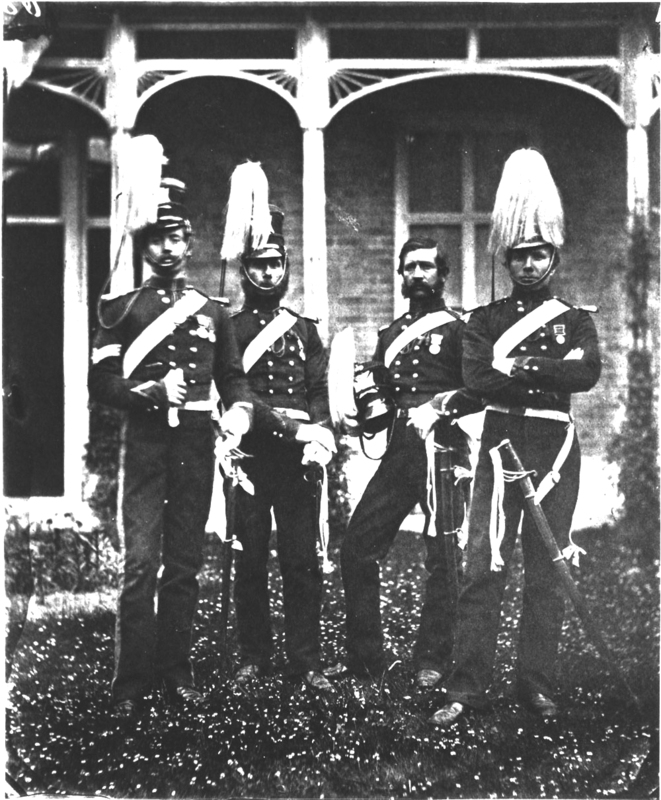 Men of the 4th Queen’s Own Light Dragoons who received the Crimean Medal from H.M. Queen Victoria, 28 May 1855. EJB’s notes say “From left to right: Sgt David Gillam – Pte John Thomas Moon – Pte Healey Stratton – Pte William Simpson.”The IWM’s online version shows them in a different order: “Healy Stratton, Sergeant D. Gillam, William Simpson and E.T. Moon”. 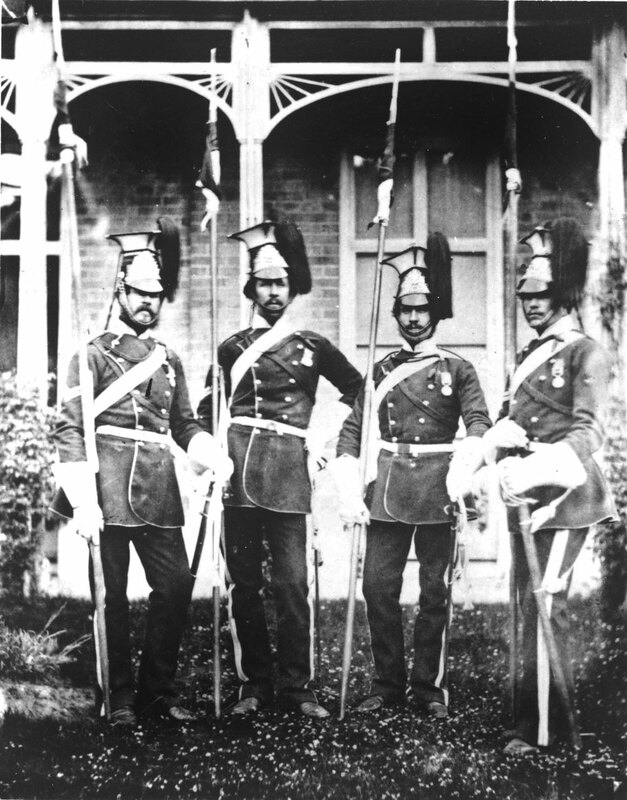 Men of the 17th Lancers. The IWM’s version is slightly different – e.g. the lances are more aligned. The men are not named. This entry was posted in Uncategorized and tagged 17th Lancers, 4th Light Dragoons, Brighton, Charge of the Light Brigade, Photographs, Preston Barracks by Philip Boys. Bookmark the permalink.